Gone are the days of hiding all your kitchen wares behind cabinet doors. 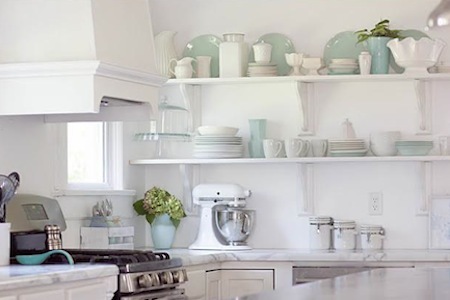 Many homeowners are now opting for a mix of cabinets and open shelving that allows them to showcase their favorite china or eclectic array of coffee mugs. Apartment Therapy and other decorating sites often feature shelving as way to maximize space while incorporating design. But just how do you get the right blend to make your kitchen looked polished and beautiful? Read on! Open shelves bring a practicality to space in addition to a beautiful way to display your wares. They turn blank areas into functional spaces. They also allow you easy access to frequently used items. 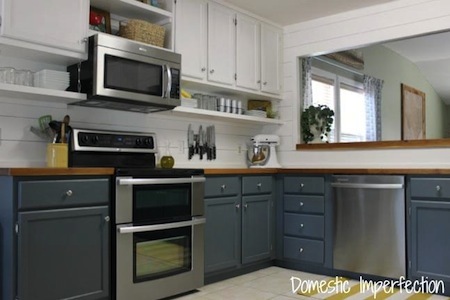 What’s more—incorporating open shelves is as easy as removing cabinet doors. This is a great option for individuals looking to make a non-permanent change to their space. Shelves can also increase storage capacity by making hard-to-reach or seldom-used spaces more accessible. Lastly, and perhaps most importantly, shelves make your room feel more open. Open shelves provide the opportunity to add interesting design elements to a space. For example, you can paint the wall, use tile or mount decorative wallpaper behind the shelves to give a pop of color. You can also use a variety of shelves to match your decor style such as metal, painted or natural wood, or glass. You can accessorize the shelves with different types of brackets and hanging systems to include additional design elements. 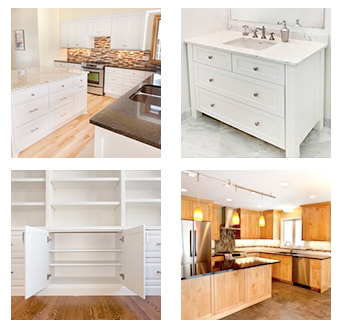 The beauty and function of open shelves provides a great pairing to cabinets. Mixing both elements in a kitchen, mudroom and other space allows homeowners to tailor the space to their storage needs. They also allow for variety in your storage options. Finally, combining both features can expand your design options as you look to create an aesthetic for your whole home. Do You Like the Look of Open Shelving? Give Us Your Opinion! We’d love to hear your ideas! Leave a comment here, share your pics with us on our Facebook page or send us a message on Pinterest. Feel free to also send us an email or give us a call! You can reach us at 952-737-7088.